الخيار الأفضل للحصول على المتعة والاسترخاء, Comfort Inn Port Fairy & Seacombe House يقع في منطقة تولونج - روزبروك في بورت فايرى. يمكن من هنا للضيوف الاستمتاع بسهولة الوصول إلى كل ما تقدمه هذه المدينة النابضة بالحياة. كما يمكن الوصول بسهولة إلى Whale Bone Studio Arts, بور فيري, Blarney Books & Art. ببساطة كل الخدمات وأساليب الضيافة التي تشتهر بها Choice Hotels تجعلك تشعر وكأنك في بيتك. يقدم الفندق صف السيارات, خدمة الغرف, مرافق خاصة بعقد الاجتماعات, مطعم, خدمة غسيل الملابس لضمان الراحة القصوى لضيوفه. استمتع بوسائل الراحة الراقية في الغرف أثناء إقامتك هنا. بعض الغرف تتضمن تلفزيون بشاشة مسطحة, اتصال لاسلكي بالإنترنت, غرف لغير المدخنين, مكيف هواء, تدفئة لمساعدتك على استعادة طاقتك بعد يوم طويل. يمكنك طلب اللائحة الكاملة للخدمات في الفندق ومن بينها حديقة. إن كنت تتطلع إلى إقامة مريحة وهادئة في بورت فايرى، فستجد في Comfort Inn Port Fairy & Seacombe House بيتك الثاني. Great weekend in Port Fairy. The Comfort Inn is right at the end of the shopping strip - a walk to the beach and wharf. Very clean and quiet. If you are heading in to Port Fairy for a few days the Comfort Inn is a perfect place to stay. I was allocated (upgraded I believe) a room which looked like the ground floor of a modern cottage. The room had a name (which always impresses me!) by the outside door as well as a number via the inside corridor door. The room (studio/suite?) was an above average size, including a lounge area with good 4* standard furnishings, fixtures and fittings. We stayed in the older section of the hotel. Room was small as a result and the floor level was not flat. It was a strange lay out room but it was clean. WiFi didn't work. Staff were helpful about where to eat and what to see. It's funny, but the staff reminded us that we were staying in the historic part of the hotel upon checkin, but in fact this very statement was music to our ears and our room looked down onto the beautiful architecture of port fairy and had charm that no "feature equipped" modern room could match. Yes, the bathroom was across the hallway, but it was very clean and to be honest, there was only one other booking on our floor - so no problem there. Anyway, great value and the feeling that we were staying somewhere special... Highly recommended! Very comfortable and clean. Good location near Port Fairy centre. This was a clean and tidy place and close to the town centre and restaurants. There is a restaurant that the Comfort Inn is attached to but it was closed on Monday night when we were there. This wasn't a hassle as we found a great restaurant in town which was only a couple of minutes away. This also provided value for money. The room was very clean, staff were excellent and a pleasure to communicate with. Great location, within a walk of cafes, lighthouse, beach and restaurants. Only negative is it is expensive for comparable hotels, though the choices are few for the area. 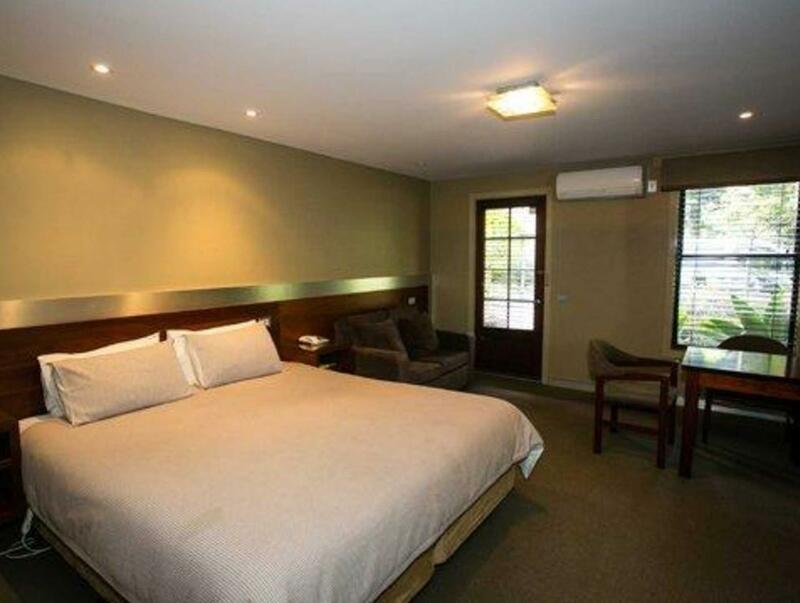 Comfort Inn Port Fairy is located very close to everything in Port Fairy. Reception is very welcoming and friendly. Free parking and Wi-Fi. We had a spacious corner room on the ground floor in the motel section. This room had a comfortable bed, two seat sofa, and a spacious refrigerator without a mini bar. The table for two made having a picnic in the room very convenient. There is a lovely 3km circular walk on nearby Griffiths Island which lies at the mouth of the Moyne River. Historical Griffiths Island Lighthouse is on the eastern tip of the island. Cons: Our room was very dark; however, this was a probably a bonus in keeping out some summer heat. No reading light. There was a light in the ceiling directly above the bed. Even on the dimmest setting, it was far too bright for reading when someone else wants to sleep. TV reception was exceptionally poor with snow and pixelated. Wi-Fi was very slow but OK for e-mail. There were two entrances to the room: parking lot and hallway. People in the hallway entrance tended to be quite noisy. Nice room with great bed. Quiet surroundings and excellent food. We had a great stay. Check in was easy and informative. The room was spacious with all usual amenities in a nice quiet courtyard with a garden view. The king bed was comfortable. The Restaurant in the hotel served us a great meal and nice wine. This hotel is a good base for exploring the local area. Centrally located, quiet surrounds, and close to both of the ocean fronts. Our stay (for us older, long-term married couple / no children to care for anymore) was really assisted by the Port Fairy/Seacombe House stay. We were able to walk just metres from it to the main area of commerce and activities in Port Fairy. The beaches were only a few blocks away too, and, to let us have a good overall analysis of the town. The Reception Staff were magnificent too. Personal, but professional. - Bravo; A very fine experience. No hassles. We'll stay there again, should we return in future. When booking this hotel we were not made aware that the room we booked had a share bathroom which resulted in us upgrading to a large King size room that would have been our first choice if we had known about the bathroom situation. The main building was of historic significance and was beautifully cared for. The rooms were well appointed, if a little dated in decor. Overall a very comfortable stay. Helpful staff and comfortable rooms. we had originally booked for two rooms with shared facilities. when we arrived the receptionist said the the rooms were on the top floor. and if we wanted my wife and myself could stay in a room on the ground floor and our 21 year old son could stay in the room upstairs. this was offered with no extra charge and great fully accepted, especially as i have a bad knee. the staff were very helpful with regards to informing us where we could eat and the best places. the complimentary breakfast was nice, especially, as most facilities in australia like to charge for breakfast and rarely do b&b, which for a brit is the norm. would recommend the location and hotel. Port Fairy was extremely quiet and deserted during our visit on a Monday. Hard to find dinner as well.. Not many shops and restaurants were open. The hotel was pleasant and beautiful but slightly expensive. It was great that the hotel provided us with drinking water along the corridor for us to top up our bottles as the tap water is a bit salty. This motel is very well situated and has good amenities. The rooms are very stylish and the fittings of good quality. Sadly the room we were allocated to the heating wouldn't work. Management was attentive and moved us to another room and gave us a complementary breakfast. However the room had no spa (although our booking was for this) and the outlook was limited. The breakfast was on time and of good quality. At check out Management again apologised for the inconvenience. a nice looking old building and pleasant enough inside - but rather basic. clean but very plain room with minimal furnishings. shared bathroom facilities and common room give a hostel feel. inexpensive, but not really our style of place. prefer to pay a bit more for more comfort and privacy. excellent fish and chip restaurant nearby - awarded top rating for victoria state. Very near to the town, quiet environment, cable tv. Quite pricey for the money paid, shared bathroom, room only fit a queen size bed. Very steep case to get into the room, very uncomfortable for me to bring up my stroller upstair. Otherwise very nice location, just 2-3min walk to nearest supermarket and shops. The Inn has lots of parking space within and around the establishment and is close to town and harbour. The room is clean and spacious and wi fi is free. A place that we would definitely recommend to anyone. Fasntastic location, walking distance to the beach and river, very close to main street, so we could walk to the shopping precident and cafe's, would reccommend this for location, price and cleanliness. we booked the guest house double which has shared bathroom facilities.fortunately that wasnt any other guests and that moment thus we could have the bathrooms to ourselves. only 1 shower facility available shared between a few rooms. common room available has microwave and coffee/tea making facilities to use which is useful for us as we were the only guests around. host was friendly and stayed later at the reception as we informed we were going to be late for checkin.